There's a quote attributed to Abraham Lincoln where he claims that a man's legs should be "long enough to reach the ground." And that's what I expect from my RPG books. The specific length or measurement doesn't mean much to me. Whether or not it "reaches the ground" (is a complete and useful text) is the key measure. On the short side, I am an appreciator of Fate Accelerated. While a number of companies have offered "quickstart" or "lite" versions of their games to appeal to newbies, they typically feel stripped down and incomplete. Fate Accelerated is a lighter expression of the Fate mechanics, but it feels like a complete game. I actually bought several copies at the last DunDraCon specifically to give to friends because it felt like giving someone a complete gamerather than a teaser product or orphan supplement. For longer works, I think my favorite would be The Burning Wheel. The books are not only thick, but very dense with text and ideas. Every word is there for a purpose. On works that aren't quite long enough, regardless of actual length, I've already mentioned quickstarts. They might be useful as a player reference, but not much more than that. The longest book I can think of that still didn't do justice to its material would have to be Oz: Dark and Terrible. It left out mechanics for magic in a magical setting and lacked a solid GM chapter with advice on putting all of the pieces together. Speaking for my own works, Adventures in Oz is the longest thing I've ever written. I find mechanics very engaging, with other details being less important. So writing up the land of Oz setting material was the hardest work, but I knew that the game would not be complete without it. As a nearly permanent GM, I’m more of a world-builder than a character-builder. But even then, I largely focus on the scenario that the party finds itself in than the structure of the world itself. I’ve actually sneered at excessive world-building as a distraction from scenario-building. Making sure you have an adventure ready for your Friday session has always seemed more important to me than reams of family trees and details that may never make it to the table. Though I am realizing that without those sorts of details, I may be limiting myself. Without an understanding of how the royal family works and who they’ve annoyed over the last century, I’ve just decided that that is a story that I cannot tell at my table. 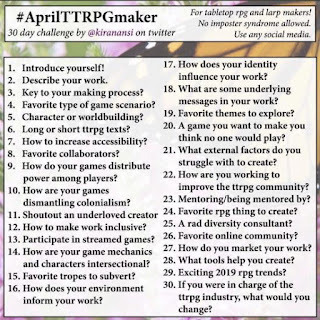 It also means that my players can run roughshod over the setting by asking fairly easy questions that I hadn’t considered and acting on the poorly-thought-out answers. As a long time GM, I've written a lot of scenarios, and run more than that. And the main thing I've discovered was something said by Princess Leia in Star Wars: "The more you tighten your grip ... the more ... will slip through your fingers." The scenarios that bomb are the more tightly structured ones. The adventures that present the tabletop equivalent of pixel-bitching. The strongest scenarios that I've run have been the loosest. My longest running campaign didn't even have a plot to speak of, being solely focused on the exploration of a megadungeon (though I do wish that I had fleshed out the world beyond the dungeon). It all comes down to character agency. Give players the opportunity to take action and make choices and they will make the story their own. Make them spend more time fighting the adventure than the bad guys and you have a recipe for frustration. My magnum opus at this point is Adventures in Oz: Fantasy Roleplaying Beyond the Yellow Brick Road. It's the first English-language RPG to use Oz as a setting, as well as the only English-language Oz RPG to be aimed at kids. I say "aimed at kids," but it's perhaps more accurate to say "not specifically aimed at adults." The goal was to model the stories as accurately as possible and to appeal to fans of the stories along the way. The mechanics are simple, both because the stories don't insist on a precise model of physics and because I am not very good with statistics and complicated math. The fact that this makes it accessible to Oz fans of nearly every age is frankly a bonus. The big feature of the system is the use of a Friends List to help players track the adventures of their characters. Every time they help someone in the land of Oz, they earn an Oz Point and may call on that person to help them out in a time of trouble. The way to get more powerful in the game is to earn Oz Points by helping as diverse a set of people as possible, so that you can call in a wide variety of favors from a broad pool of magical and special talents. With all the upheavals that have been going on in my life lately (and not all of them settled out), I missed a new blogfest thing going around. And since I need something with a little structure to it right now, and maybe the act of writing will be therapeutic, let's see if I can do this. You had to start with a tough one, didn't you? I'm not that good at talking about myself, really. As for the mundane part of my life, I've been working in the restaurant industry for over 20 years and feel stuck in it. I spent 3 months after I moved looking for non-restaurant jobs, and got some interviews, but didn't get an actual offer until I lowered my standards and started applying at restaurants again. I'm getting more hours than I did back home, and actually getting paid decently feels amazing. I've been married for almost 8 years (My anniversary is next month! ), but my wife and I have known each other for much longer than that. She's actually the person who introduced me to RPGs. Indirectly, anyway. She introduced me to RPG books, which I then started collecting and then actually playing with. After I got laid off from my first job, I went through a bit of a crisis that led to me becoming an RPG publisher. Looking at my life, I realized that I hadn't really done anything with it. I hadn't made my mark on the world. So I dedicated myself to turning a thought experiment I had (How to turn the Oz stories into something gameable) into a finished product. Adventures in Oz: Fantasy Roleplaying Beyond the Yellow Brick Road has been an great experience all around and you'll probably read more about it as this progresses. It's been relatively good news in the last month and a half since my last update. Meetup.com has resulted in a string of one-shots that is trying to turn into a campaign. 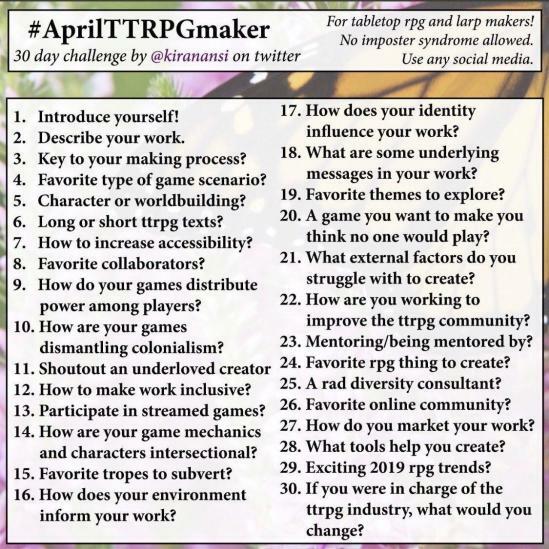 I am chomping at the bit to run something myself, but I don't know if I want to pitch a big campaign or something small and I still don't have the confidence to ask all the new people I'm meeting. Maybe soon. It doesn't help matters that the vast majority of my gaming books are packed in boxes. I've got a few out, and I am building up a digital library, but there's nothing quite like pulling a random gaming book off the shelf and seeing what ideas emerge from it. The other good news is that I am now working full time. Before I moved to San Diego, it seemed impossible. I went to every interview prepared to go to war for a full time position. But as I spoke to people, the hard limit I experienced back home wasn't as big a thing here. It's much like when I started working, all those years ago. Show up, do the job, be reliable and the hours will come to you. I'm looking forward to my first paycheck some time this week.